It is remarkable the tiny, half-forgotten memories which resurface when one contemplates a big event, such as the forthcoming referendum on the European Union. For my part, I recall a past European Summit (although, sadly, not which one). I was attending one of the interminable briefings which, then and now, characterise such events. Alastair Campbell was expatiating on behalf of the UK Prime Minister, Tony Blair - which helps to date the event a bit although not enough for me to pin down the precise moment. Might have been Amsterdam? Anyway, it was plain from Mr Campbell's demeanour as he entered - and indeed from his slightly grumpy opening remarks - that he had, in practice, little to share with us. He was simply observing the proprieties of summitry. Inviting questions, Mr Campbell palpably brightened as he gazed at the representatives of the wicked media, palely loitering before him. "I could do with a laugh", he grunted. "Boris, why don't you get us started?" Up popped Alexander Boris de Pfeffel Johnson, then the Brussels correspondent for the Telegraph. Mr Johnson entertained us all with a trenchant commentary upon whichever malfeasance was being wrought upon the British people, in his view. At the close there was even the scintilla of a question. Today, Mr Johnson features in the Telegraph once more. Now an MP and the retiring Mayor of London, he is advocating that the people of Britain should vote to leave the EU on the basis that it is only such a verdict which will restore British sovereignty. Advocates of Brexit are delighted. They believe they have secured a potent, fluent champion to advance their cause. David Cameron, of course, is less than enthralled. One, he is concerned that the advocates of departure may be right in their assessment of the impact upon the wider campaign. 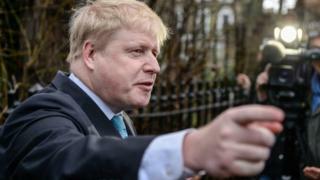 Two, Mr Johnson's decision can only serve to sharpen the fundamental divisions which are prevalent within the Conservative Party. As I have noted ad nauseam, political parties are coalitions of the more or less willing, generally held together by a wider cause - that cause usually being the desire to secure power. That glue comes unstuck when a substantial segment of a political party concludes that there is an issue - say, the EU - which is more important than winning and retaining power. Mr Johnson notes in his carefully phrased piece today that the important thing is to get a result - and then to "get on and unite around David Cameron". But would such a phenomenon be feasible, even presuming that it is thought desirable? Would not David Cameron have to resign if he lost the referendum? Would it not be impossible for him to negotiate the details of Brexit - when he had so strongly advocated remaining within the EU? Further, party political - and personal - calculations have formed a significant element of the manoeuvring prior to the EU deal and the announcement of the referendum date. Mr Cameron calculates that a referendum is the only way to counter the Euro-sceptic thinking prevalent in his party and, indeed, Cabinet. The date? He wants this over reasonably quickly and does not believe that the objections from Scotland have been sufficiently strenuous. But comparable calculations apply to other politicians. Senior Tories have to weigh their own prospects in the balance. That applies amply to Boris Johnson who, of course, harbours leadership ambitions. Liberal Democrats may be presumed to be vigorously pro-EU. Labour? They have opted to back the stay option, despite the temptation of voting quit and potentially adding to Mr Cameron's problems. Which brings us to the SNP. Nicola Sturgeon faces a conundrum all of her own, daily adumbrated by pro-EU soothsayers, mostly of the Tory persuasion. Vote to stay in the EU, they urge. Otherwise, the resulting tensions will split the UK apart. Ms Sturgeon hears these forecasts. She weighs them. She contemplates them. She thinks: "So voting Leave means the end of the UK, eh? What's not to like?" Her conclusion? Vote stay. Remain in the European Union. This has generated a range of reactions. One or two supporters of independence say that it would suit Scotland's longer-term interests to back Brexit. Meanwhile Lord Foulkes, a long-standing Labour advocate of EU membership, detects double think in Ms Sturgeon's stance. That is because she has said that British exit without Scottish consent would be "almost certain" to heighten demand for a further referendum on Scottish independence. It could be the fabled trigger. But if Ms Sturgeon's aim is to use the EU referendum to advance the cause of independence, then why not argue for a vote to quit, presuming that such might enhance demand for a Scottish plebiscite? Why advocate the opposite outcome to the one which would, arguably, suit your party's purposes? To recap a little. Like all other prominent politicians, Ms Sturgeon has to consider the prospects for her party - and that party's founding aim - in devising a strategy for the European Referendum. In short, what does this all mean for independence? But Team Sturgeon are adamant that their boss has not been modelling herself upon Niccolo Machiavelli or any other Renaissance statesperson. They insist that she supports the EU out of collaborative, co-operative principle. She would prefer independent Scottish membership, of course, but in the interim wants Britain to stay on board. Taking that assessment at its word, we may nevertheless still see other elements at play. Firstly, the SNP has been pro-EU for decades. It is a basic part of the party's offer: that independence for Scotland would mean joining the EU as a partner, not just leaving the UK. It is about reassurance. Secondly, it might arguably be seen as a political calculation too far to switch now that the EU referendum is upon us. It might not appear comprehensible or coherent to the voters. Plus, how would a switch back to supporting the EU in the event of seeking Scottish independence be remotely credible? Thirdly, Ms Sturgeon talks of Brexit without Scottish consent as a probable trigger for an independence referendum. Which, some say, mean she is angling for such an outcome. To quote Machiavelli, "no enterprise is more likely to succeed than one concealed from the enemy until it is ripe for execution." Team Sturgeon say no. She is pursuing principle. Further, she is simply acknowledging that Brexit might trigger demand for a further Scottish plebiscite. She is not saying such a further referendum is guaranteed, or automatic. Yes, demand might heighten. But there would be other calculations - most notably the small matter of whether the people of Scotland would be inclined to vote Yes in such a poll. In short, demand for a poll might rise. But not perhaps demand for independence - or, at least, not by a sufficient margin to counter other concerns. It is even possible, for example, that Brexit might reduce support for Scottish independence. Might there be some wavering voters who turned away from independence on the grounds that the political world was already unstable enough as a consequence of quitting the EU? Remember that Scottish independence is posited upon a sense of confidence, not upon a sense of flight. Might confidence be lessened by the uncertainties of Brexit? I think that is, at minimum, one factor for Ms Sturgeon to bear in mind.